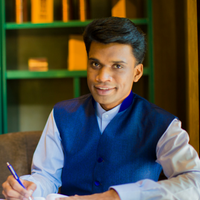 Girish Kumar is a relationship healer from India and the founder of Human Connect, a personal transformation company. He has developed his own healing technique called ‘TRAMA Tuning’, which stands for Transforming Relationships & Manifesting Abundance. Using TRAMA Tuning™, Girish helps his clients to remove the blocks in their energy body and experience abundance in every aspect of their life, with prime focus on relationship.